I am not a hairdresser, nor do I really know anything about cutting hair. I do cut my own hair. Not all the time but more often than not. When I lost my corporate job I was trying to cut costs and I believe my hairdresser at that time raised her prices on me without telling me. I understand when stylists have to raise their prices, but in the past I had been notified in advance, she just tacked on some money one time when I went to write my check. Which upset me, I had FINALLY gotten her to cut my hair the way I wanted. So the two situations (job loss and no advance notice on the price increase) had me exploring other options. When my hair got too long to tolerate I would just chop at it with my cuticle scissors. They were sharpest ones I had. Or maybe I used my other pair and they got dull and I started using my cuticles scissors. No, it was my cuticle scissors first because I remember laughing and thinking I was Kinsey Millhone – hacking at my hair with little cuticle scissors. Every once in a while I do go get my haircut, but I go to a place that does not take appointments and so sometimes I am sitting there for 45 minutes or more and that is just annoying. The last time I was there she mentioned that she spends more time on me than any once else so I kind of felt bad taking up so much of her time, so I haven’t been back. I have also been challenged with getting my hair stylists to cut my hair like I want them to cut it. I am not one to have the latest style anything (clothes, hair, makeup) so I want my hair cut like I want my hair cut and because of my work, I want it to be as easy breezy wash and go as possible. Most of the time I am out with sweat drenched hair. Yeah, that sounds gross, but when I finish a class and I am right next to the grocery store, I am NOT going to go home and shower and then go all the way back. I just run my errands after my classes on my way home and I need my hair to be acceptable looking after I towel dry it. When I go out, I do my hair, but that is not as often as me running errands after a class. I hate flat hair and when my hair is too long it just lays flat. So I like it a little shorter and choppy. It is the choppy I can’t get a hair dresser to do. So usually I come home and end up chopping at it on my own. So I just decided that – for the most part – if I am going to come home and cut my hair after I get it cut, I might as well do it myself. The problem is . . . oh, heck, there is more than just one problem with me cutting my own hair so I won’t get into all that. What I will say is a good pair of scissors makes all the difference in the world. I bought a low-end good pair of scissors. I can understand why stylists spend a lot of money on scissors. They need to be good in order to cut the hair. And since they (stylists) actually know how to use them they can do wonders. My aim is to get my hair out of my eyes and if I can, make it stick out a bit. I could very well be walking around looking like I cut my own hair, but now-a-days people walk around with all types of stuff going on up there so . . . that is ok with me as long as I am ok with it. And I am. Especially since I purchased actually hair cutting scissors. They make it so much easier to cut my hair. One thing though, I cut my hair wet so, I never really know what it is going to look like when it is dried and styled. I don’t actually cut it the same way every time (refer back to the “I don’t know what I am doing.”). I just cut my hair today and had my scissors out and that is what made me think to share how a good pair of scissors can make a world of difference. I don’t know what my hair will actually look like, I have yet to see. Do you have a pair of specialty scissors? Perhaps for hair, gardening, cooking? This entry was posted on July 18, 2018 at 5:10 pm	and is filed under Misc. 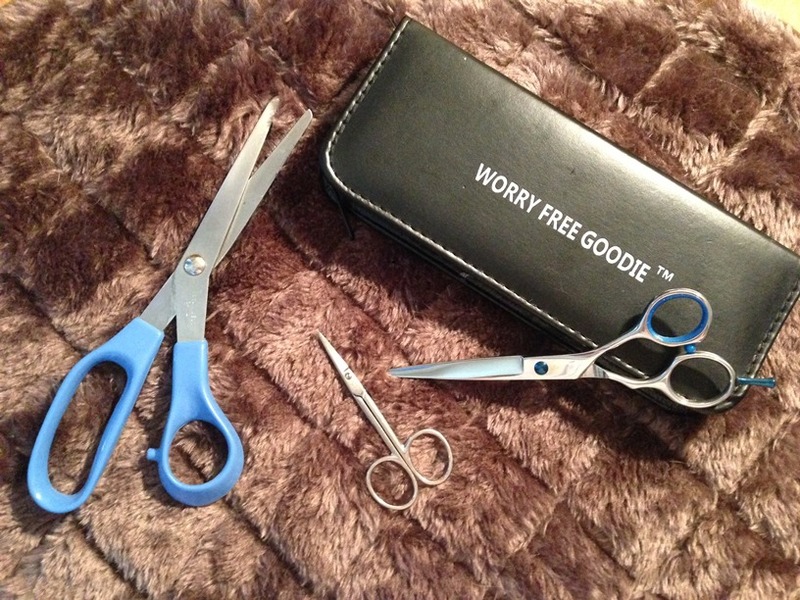 Tagged: cuticle scissors, cutting hair, Goodie scissors, hair stylist, hairdresser, Kinsey Millhone, scissors. You can follow any responses to this entry through the RSS 2.0 feed. You can leave a response, or trackback from your own site.